Conditions are favorable for soybean seedling disease in many areas. Wet soil, slow emergence, and delayed planting have been favorable for seedling diseases in many areas of southern and central Minnesota. Now as the soil dries and warms up, infected plants may wilt and collapse rapidly due to damaged root systems. Problems with seedling disease have been reported from several areas, and more will likely be noted as plants continue to emerge. Given that seedling diseases have developed in some of the well-drained soil at Rosemount, MN, these problems are not restricted to poorly-drained fields this year. This is a good time to scout fields for seedling disease problems. How to know if seedling diseases are developing? Infection of seedlings before or after emergence can result in missing plants, plants that are stunted and dead, rotted roots, and wilting. 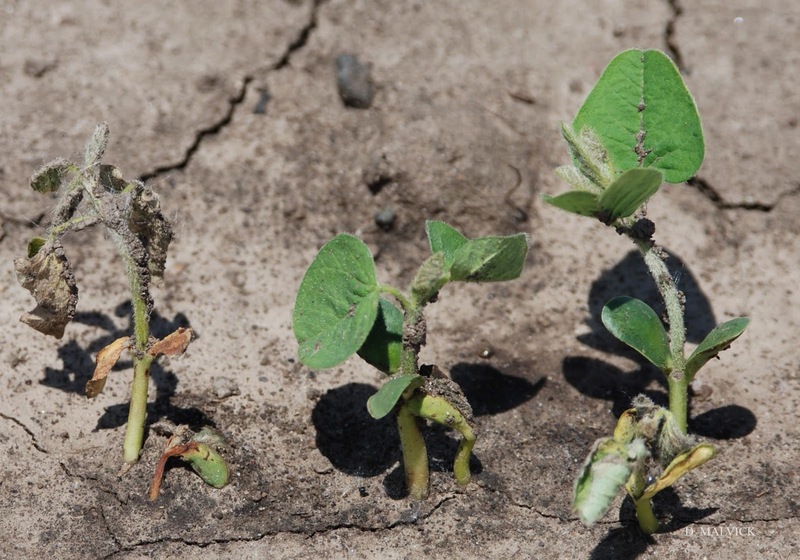 Slow plant emergence could be due to many factors, including seedling disease and crusting. Vigilant scouting and diagnosis are often required to identify the main cause of a problem. Scouting can reveal where and which diseases are developing, and can assist in managing them and understanding efficacy of seed treatments for future years. Phytophthora root rot is also favored by wet and saturated soils, although it generally prefers warmer soil conditions than Pythium root rot. The light, soft-rot symptoms on roots caused by Phytophthora are very similar to those caused by Pythium, and laboratory diagnosis may be required to tell which disease it is. Phytophthora can damage soybean seedlings or initiate infections in the spring that may result in severe root and stem rot in July and August. Two species of Phytophthora (P. sojae and P. sansomeana) are known to infect soybean in Minnesota. 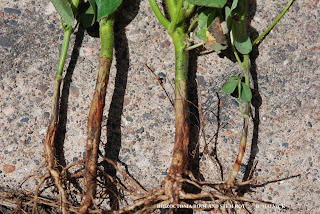 Rhizoctonia root and stem rot caused by Rhizoctonia solani is also a widespread problem in Minnesota. Warm and moist soils favor Rhizoctonia root and stem rot. Plant stand loss can be high when soil is warm (>74F) and wet while seedlings are in the VE to V1 growth stages, as these are prime conditions for disease development. Thus late May to early June emergence in wet and warm soil favor Rhizoctonia root and stem rot. Reddish to dark brown, firm and often sunken, lesions caused by Rhizoctonia develop on the stem and often girdle stems near the soil line. The symptoms can be confused with those caused by other seedling diseases. Multiple excellent resources are also available from the North Central Soybean Research Program.